Swamp Suburbia: FINALLY PEARL HAD HER BABY!! 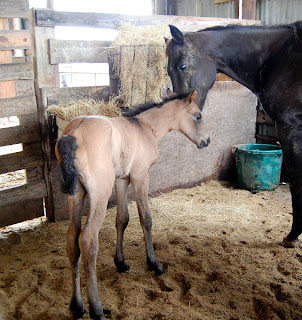 This morning I got a call at 7:30am from my Father in Law that Pearl had a foal. I thought he was joking, because he had been saying that she would have her foal today. I was banking on the 15th, but I guess with the drop in pressure, Pearl just couldn't hold any longer. So, I won't keep you all waiting any longer because I just couldn't wait any longer. 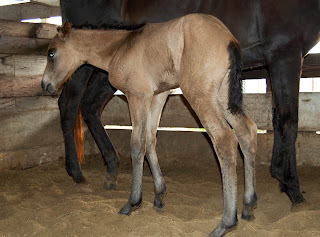 We had a beautiful, super tall, buckskin filly. A girl! I was totally surprised about that! What? You can't see her? The kids were all so excited to see her. They all wanted to rub her all over. 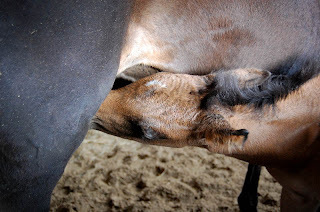 Foals are nice when they are first born. Okay, here she is at just a few hours old. She still looks like she is bent in half from being in Pearl's belly. What? You don't see any paint spots on her? Well, that is because she doesn't have any white on her. Except for just on little spot on her forehead. And it's just a tiny little speck. So, no regular registry paint for me. I guess I am just not going to have any paint horses to show. She is really tall. Her back is taller than Little Cowpoke. I am hoping for a nice Hunter Under Saddle horse. We have a lot of open shows around here where I can get PAC points on her. I have never had a buckskin filly before. So, do all buckskins have a really dark spot over their withers? 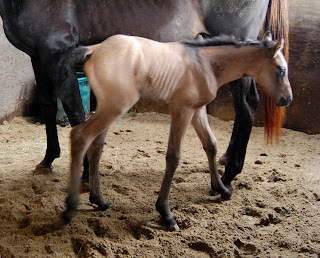 She is a really dark colored buckskin. A lot of black around her eyes and muzzle. 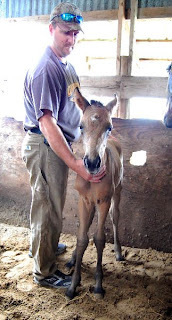 To get an idea of how tall this few hour old filly is, this picture below is of my brother in law. He is a bit taller than 6 feet. She is going to be a tall one. I hope she will get at least 16 hands if not taller. After I took way too many pictures, we decided to leave the momma and baby alone for a little bit. I took a few more pictures from outside the stall. I wanted to give them there room. Pearl was one tired Momma. I think she was grateful that foal was now on the outside. She is such a good momma. Tonight I will brush her and put a halter on and off of her and rub her all over with a towel. We do a little bit of imprint training on ours. 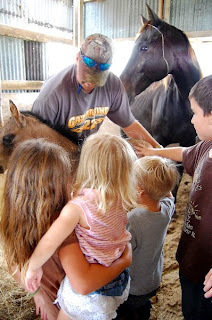 We like to be able to halter them, brush them, pick up their feet, and just plain handle them with out any fighting. It's a lot easier when they are young. Congrats Pearl on a cute filly. Now I have two no name fillies. Her name needs "ZZ Top" in it because "SHE'S GOT LEGS"!!! Two proud Mommas. Pearl & you. Oh my gosh. She is soooo cute! I love, love, love her coloring. wow. If he's about 6 ft tall, she IS huge!! She's adorable. I can't blame all the kids. I'd be wanting to spend the night out there. Congrats on the two nameless ladies. Something will just click and then that will be that. Oh she is just a beauty. So glad for Pearl, even though she is tired she must be relieved. Congratulations! Yea! Finally! Congrats Pearl! I'm glad it all went well. Did Pearl do it all on her own? Now you need a name, oh yes! Let us know if you need any help! Look at those legs! She'll be quite a looker if she keeps that dark shoulder. Congrats on the new bebbie. What a beauty! Glad mommy and baby are doing well! I knew she was going to have a filly! And its about time too! She is just too cute, can't wait to meet her and get to help with the imprint training! Congratulations. My husband did come home with the neighbor's mare and she is due late May thru Mid June. 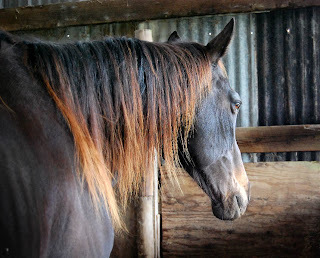 She is a sorrel quarter horse mare bred to a paint. 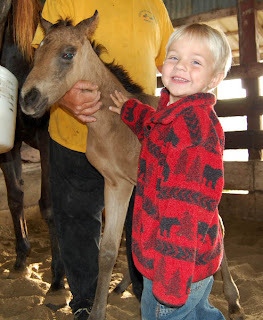 We have got our finger's crossed for color, but I would take your little buckskin filly anyday. I love buckskins. Does she have a black line going down her back to her tail? She may be a grulla or a dunskin. She sure looks like one to me. AWESOME!!! Congratulation, Pearl can be proud of herself. The color is really nice and yes she is tall, now no name will have some one to play with. Thanks for showing her off to us, have a great week. Also you are now stuck with two foal's to name. Oh, she's beautiful! I was so excited to see she finally had her foal. I love Rachel Diva Rachel's suggestion--ZZ. What a cute story that would be--her long legs and all. Yaaaaaaay!!!!! I was so excited when I saw the title of this post on my sidebar!!! And what a beautiful little filly! About those legs...her TB genes are definitley showing...lol!!! And dark spots/smudges?? She'll probably have that all over at various times of her life when she grows new hair and sheds. She is adorable! And tall - Patrick was tall like that when he was born. His legs were all crocked from being balled up inside of Gracie. Did you measure her? You'd look so good on a tall buckskin in Engish wear scootin around out there - maybe she would do all-around stuff too, you could sneak her into WR or Trail - I see alot tall english horses that can do that. I am just amazed!! How did that mommy get all of that pony inside of her? Congratulations!!! She is so pretty!! Is that OK to say that houses are pretty!! Anyway,she really is!! Yeah! Don't worry - I haven't had a foal yet! I'll twitter it ASAP when it happens! I think it's going to be real soon though. Baby is super active inside and I caught Rum kicking back yesterday so she's pretty uncomfortable. Just really busy with school to update - but hope to later today. Yeah, finally! Congratulations on a beautiful filly! I love her color. I am so anxious for my little one to be born now. Annie is due mid June. Look at the legs on that thing! She's gorgeous. WOW! 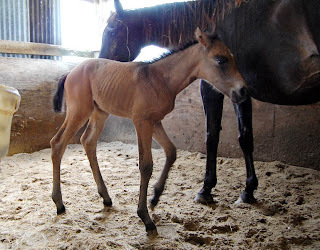 That foal is gorgeous!!! I'm so excited! I hope you will post more photos of her as she grows. Congrats to Pearl and all of you there!! !